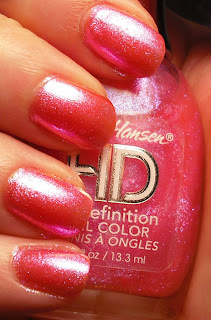 I really liked the summer Sally Hansen HD collection. I loved all the sparkly duochrome colors. The only issue with them is they are SO sheer! One of my favorites was LCD, but it's so sheer I don't know hot to wear it really without compromising the true color. I lost track, but I believe this is 5-6 coats of polish to achieve opacity. That is insane and ridiculous, but I love the way it looks that way. 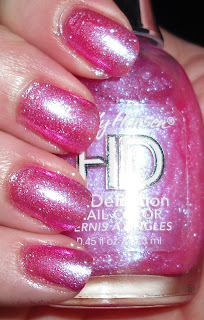 This is a light bright pink with glass fleck glitter that flashes violet and blue. I adore this the way it is, but there is no way I'm doing 5-6 coats of it. I guess I'll have to find a suitable pink to layer it over to maintain it's actual color. 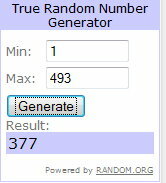 On to the Sparkle & Duochrome giveaway winner! Thank you all for participating in this giveaway. I had so many entries! Congrats Amanda!!! Amanda has a blog Fiercely Fresh Fingertips. I will be posting a holiday giveaway shortly for US residents. Be on the lookout for it after Halloween! Maybe you could layer it over a similar pink? I agree with you - they're deceptively sheer. I have the blue one and I always have to layer it over black. :O whoa cool THANK YOU!!! i've seriously never won anything before..and mac bad fairy was the only one i am missing from the collection! congratulations on SO many followers!!! we enjoy reading your posts, i know i do. keep up the great work! Congratulations Amanda! I agree with you, I really enjoy this blog and Steph's writing. She deserves all the followers she's got... and more! Congrats Amanda! I love this HD pink, so pretty! Leslie- Thanks. I've actually seen these in clearance bins some places, so you may want to check them out. Megan- I'll try to find a pink to match with it. You're so right they are "deceptively" sheer! Jackie- I don't want to swap it. I love it to much I think I'll just have to layer it. Donna- Aww thank you for your kind comment. I really appreciate it. necessary- Thanks for the tag! Freshie- Thanks! It is pretty if only it wasn't so sheer! Enamel Girl- Ugh..lol 50-11 coats. I know it's ridiculous! I just wanted to say that today I am wearing Laser for the first time. OMG! It's gorgeous! I was really nervous with the first coat because it's so thick and streaky, and yet the color is sheer. The second looked so much better, still vnl, but not streaky. The third was opaque for most of my nails, I still had to touch up two of them. So, to recap, still takes a bit of work to get opacity, not as bad as LCD, but the payoff is sooooo worth it. Try China Glaze Sugar High under it and it looks AWESOME! !